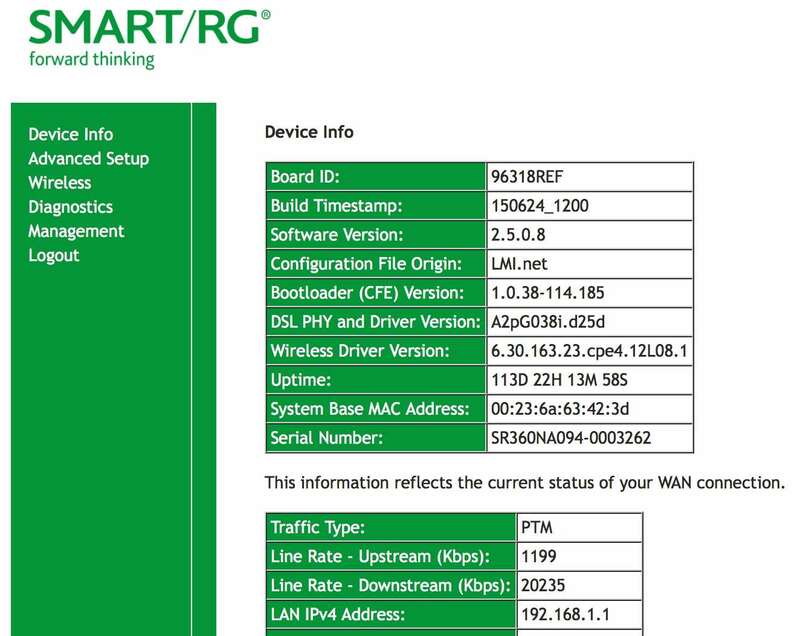 The SmartRG DSL routers we use generally do not require any special configuration other than setting up a wireless network name and password, and the LMi.net installer will typically do this for you. If wireless settings are all you need to configure, the Quick Start guides will provide all the instructions you need. For complete documentation, you should download the full User Guide. The purpose of this page is to just document the settings that most people would want to adjust. You will need to be connected to the router, either wirelessly or via a direct Ethernet connection. Login as admin, with the assigned password. Statistics submenu. This shows traffic on the 4 Ethernet ports, as well as wireless connections. Received traffic is data you are uploading to the internet, Transmitted is data you are downloading. DHCP. This shows you a list of devices that are currently connected and have an IP address assigned by the router. Most devices will have a hostname that will help you identify the device. The MAC address is the physical hardware address of the device. DSL. If you want to increase the upload (and decrease the download) speed of your DSL line, you can enable AnnexM under DSL Settings. Note that you will need to turn off Annex-M mode on our end, either by using the PHO Dashboard, or by contacting our support dept. Basic. This is where you assign a wireless network name (SSID). If you want to setup a guest network, you can enable one of the 3 possible networks listed and give the network a name. A guest network is useful if you want to give someone temporary access to your network without giving them your primary wireless password. You can also turn off wireless access entirely, or disable the WiFi button.. (the WiFi button enables you to toggle WiFi access using the physical WiFi button on the router). Client Isolation will prevent one device on your network from seeing any other devices. Hide Access Point will prevent the SSID from being announced. You will then need to type in the network name (along with the password) in any device you want to connect. Security. This is where you assign a password for your wireless network. We recommend using the default “Mixed WPA2/WPA-PSK” authentication method for compatibility with the most devices. The passphase is displayed in bullets. Click the “Click here to display” link to show it. If you have setup guest networks, you can select the guest SSID from the menu and assign a password. If “Use base MAC address as WPA passphrase” is checked, then the wireless password is the 10 character MAC address printed on the back or bottom of the router.. If the router is reset to default settings (using the pin hole reset on the back of the router), then this option will be enabled. WPS is a system that supposedly make it easier to attach printers and other devices to the wireless network without needing to use a password. This is disabled by default. Advanced. The main thing you might want to do on this page is change the channel the wireless radio uses. The default setting is “Auto”, which means the router will scan other wireless networks when it boots up amd select one that is not already used. This doesn’t always work, so you may want to manually specify a particular channel. Please see this postfor more info. For those of you that are technically inclined, you can ping or trace route to remote hosts to test connectivity. This is typically done from a computer connected inside your network, but this can be very handy when you are using a tablet or smartphone that doesn’t have a command line interface. Access Control. This is where you can set the password for the management interface. We recommend you do this. Click the Password submenu, and enter admin in the User Name field, then type the old password (presumably admin) and then type (and re-type) a new password, then click Apply/Save. Setting the router into bridge mode. Configuring a static WAN IP address.